Monster unleashes Beats Solo HD headphones with iPhone control | What Hi-Fi? The new Beats Solo HD on-ear headphones look to build on the sound quality of the rest of the range – of which we're confirmed fans – while adding Monster's own ControlTalk for iPod and iPhone control. Infamous producer and artist Dr. Dre, Interscope Geffen A&M chairman Jimmy Iovine and Head Monster Noel Lee have all worked together to ensure the new addition is a worthy member of the Beats family. ControlTalk is 'an advanced on-cable feature', which to you and me means it will control your portable as well as taking calls when partnered with many smartphones and of course the iPhone. This ControlTalk feature will soon be available on all Monster brand headphones. Additional features with the Beats Solo HD include a unique tri-fold design and a carrying case, together making the headphones perfectly portable. 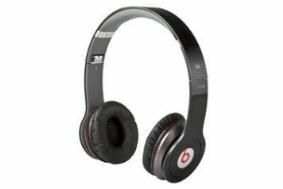 The Monster Beats by Dr. Dre Solo HD headphones (breathe), will be available in April 2010 for a suggested retail price of £169.95.